Citation: Tung TS. The Communication and Interpretation of the One Belt and One Road by Chinese and Vietnamese Media in the Perspective of Frame Analysis - A Case Study of China Radio International CRI and Voice of Vietnam VOV in Comparison. Global Media Journal 2018, 16:30. Copyright: © 2018 Tung TS. This is an open-access article distributed under the terms of the Creative Commons Attribution License, which permits unrestricted use, distribution, and reproduction in any medium, provided the original author and source are credited. In visiting to Kazakhstan and Indonesia, China’s President Xi Jin Ping proposed his strategic vision of “New Silk Road Economic Belt" and “21st Century Maritime Silk Road" in September and October 2013 respectively. Since then, the “One Belt And One Road” initiative has attracted international attention. There are 64 countries and regions along the line “One Belt One Road”, all countries have different cognitions and reactions to the “One Belt and One Road” initiative by reason of some aspects such as geopolitical benefits and cultural differences., the United States, as China's biggest rival, had a relatively complex perpective of the “One Belt and One Road”, with positive affirmation, neutral, negative disavowal in coexistence , but in general, the United States’ doubt about China’s initiative was obvious, it believes that China desires to expand the international influence through the “One Belt and One Road” would directly affect the US’s benefits and leading position in Eurasia . Although Russia publicly supported the “One Belt and One Road” initiative, said that it was a good opportunity and brought mutually beneficial win-win results to both sides, but also showed the vigilant and nervous attitude towards the “One Belt and One Road” initiative at the same time . India belongs to ambiguous hesitant faction along with Russia, its government also publicly supported the initiative “One Belt One Road”, but still took relatively obscure precaution against China‘s "power expansion" , also indicated that it was a kind of remission of the fears of other countries about China's continuously growing force/power, the "One Belt And One Road" initiative not only could improve their international position and influence, it is also a response to the United States to bring pressure on China . Vietnam, which borders on China and has a territorial dispute, has changed from "suspicion" to "cautious welcome" in its perception and attitude towards "One Belt One Road" . Since the official establishment of diplomatic relations between the Democratic Republic of Vietnam and the People's Republic of China in 1950, so far the two countries’ bilateral relation has experienced a lot of ups and downs, but the bilateral friendship has also been strengthened constantly. However, there exists a tension core problem is the territorial sovereignty in the relation of China and Vietnam and both countries announced their own territorial waters towards this region that causes a lot of frictions and conflicts. Since 2015, on principle of respect for the benefits of both sides, Vietnam also has repeatedly expressed the willingness to work with China to promote the cooperation’s under the framework of "One Belt One Road" and "two corridors and one economic circle", that was an important significance to the construction of the "One Belt One Road" initiative, Vietnam’s General Secretary Nguyen Phu Trong obviously expressed support for the International Cooperation Summit Forums on the "One Belt One Road" initiative held successfully in 2017 after meeting with China’s President Xi Jin Ping. The two sides have reached a consensus on enhancing cooperation in various fields under the framework of "One Belt One Road" and "two corridors and one economic circle" following the principle of equality, mutual benefit and compliance with the laws of both sides. In Vietnam, the news media is the essential information mean of social life, the speech organ of the Party’s organs, the State organs, socio-political organizations, socio-political profession organizations, social organizations, socialprofessional organizations, and the forum of the people as well. Its main duty is to propagate and popularize the Party’s propositions, policies and national laws, and to make a contribution to the political stability, eco-social development and the improvement of people’s intellection. The Vietnamese government unifies and manages the news media, and the ministry of information and communications is responsible for the management of the news media to the government. Therefore, the country’s news media need to follow the guidance of the communist party, state administration, and the news media activities need to abide by the laws and regulations . The important mission of the news media is to guide public opinion, China published the "nine-dash line" and established SanSha City in 2009, result in increasing tension situation of territorial waters dispute. Faced with this situation, the Vietnamese communist party and the government made clear that the contradiction between the two countries is quite complicated, whereas Vietnam’s highest principle is to defend national independence and territorial sovereignty. The ministry of information and communications of Vietnam required the domestic mass media not to incite public opinion, but to do ideological work well for officials, party members and people . Vietnam's Prime Minister Nguyen Xuan Phuc emphasized: “Our media is a revolutionary media and every reporter … actively struggle to defend the sovereignty and territory of the motherland…”. For such a neighboring country that has long-term friendly and complicated relations with China, by examining the reports and interpretations of its national media on the "One Belt and One Road", it indirectly reveals the attitude and opinions of the Vietnamese government and compares it with China's reporting on Vietnam. It will help China to carry out external communications on the "One Belt and Road" issue. Framework studies have arisen since the 1970s. As regards the origin of framework theory, some scholars think that the clues could be found from two research fields ; the first one is sociology, the frame is a psychological principles and subjective process of personal organizational events. People regard the daily life real picture into the framework, in order to understand and react to the social situation ; the second one is psychology, formed a kind of hypothesis construction regarding individual cognitive process, also named schema, our knowledge is stored in the memory in the form of data structure, called the frame . There is similarity in these two fields’ viewpoint, that people use the frame as a tool to identify the external world. Then frame started to be used in the field of journalism and communication, the concept of "media frame" came out, supposed that frame is a tool for journalists to package up a large amount of information and deliver it effectively to the audience . The frame can be divided into two levels “boundary” and “building frame”; "boundary" is known as a kind of border, the range of drawing materials, while people explain events of the outside world through “building frame” . In conclusion, although there are a large number of researches regarding frame definition, the core idea of these researches is still related to the fundamental process of meaning construction in which some aspects or characters or some ideas, themes and experiences of issues or events are highlighted or attract attention, while others will be ignored . The frame theory has been widely appreciated and applied by journalism and communication scholars in the 21st century. Though the frame analysis was not originated from the field of communication, it had become a hot topic of communication. After more than 20 years, the communication research on the theory and approach of frame analysis has no breakthrough, or even become vague . The news frame analysis can be divided into three categories: discourse, discourse construction and discourse acceptance. The news frame can be divided into many types, such as thematic frame and fragmented frame, strategic frame and topic frame . The news frame mainly includes text contents such as the presentation mode, some key words, phraseology, news source, news schema structure and so on. However, the framework of news report can be presented through syntactic structure, script structure, thematic structure and rhetorical structure , and the emphasis of speaker when narrating or discussing a certain news event or topic , reveal the idea of the construction of news metaphor, the news media leads to different thinking and perceptions through different frames . Based on the above viewpoint, this study examines the two countries’ media on the same topic of China‘s initiative “One Belt One Road” with the same topic but different framework setting, and reveals the characteristics of the two media's dissemination to the same audience. This study chooses Vietnamese version of Online News Network China Radio International (CRI) and Voice of Vietnam news (VOV) as the study object, analyses the news reports and their differences of the two countries’ media regarding “One Belt One Road” initiative, and the reasons of report differences as well. Due to CRI Online news is one of China's official media with Vietnamese version, so understanding this network’s news reports in regard to the “One Belt One Road” initiative is the way to understand how the Chinese government to spread the “One Belt One Road” initiative to Vietnam; and Voice of Vietnam (VOV) news network, which is supervised by the government, is also Vietnam's official news site and represents for the voice of the government. By using key words “Một vành đai, một con đường” ("One Belt And One Road") and “con đường tơ lụa” ("silk road"), this study collected all the relevant news reports of the Voice of Vietnam VOV from September 1st 2013 to April 30th 2017, obtained 80 articles of samples in total, in which two of them were the same, so only 79 articles left after screening. At the same time, the study also collected all reports of the "One Belt One Road" initiative on CRI Online, total 30 articles. From the perspective of frame analysis, the study compared the two countries’ media coverage of the "One Belt One Road" initiative, analyses the three levels of news frame in relevant reports (macro concept hierarchy framework, mid-level framework and micro-text hierarchy framework), referred to context creation, word usage, report tendency and report source and so on… of the "One Belt One Road" initiative, made further interpretation of the initiative "One Belt One Road" presented on media, and probe into the differences between Chinese media and Vietnam media and their causes. Vietnamese media coverage’s source is more abundant: The source of CRI and VOV reports involving the "One Belt One Road" initiative reflects relatively obvious differences, China CRI’s report sources primarily come from domestic official media, such as CRI (16 articles), CRI Online (3 articles), Xinhua news (8 articles), Xinhua net (1 article) and China news (2 articles). Vietnam VOV’s report sources mainly come from domestic media such as VOV (64 articles), Vietnam news (1 article), the Ministry of Foreign Affairs (1 article), and foreign media such as Interpreter （ 1 article, Reuters (4 articles), Russia-Direct (1 article), Sputnik (2 articles), Tehran Time (1 article), Xinhua news (3 articles), Yonhap (1 article). Despite small quantity of direct transmission fromforeign media, in term of the information sources of news coverage’s main text, CRI reports information mostly come from the spokesmen of Chinese and foreign government organizations, scholars at home and abroad, the Chinese and foreign enterprises leaderships, while VOV not only includes the spokesman of government organizations, scholars at home and abroad, but also direct cites the commentary of the more authoritative media in the west. It can be seen that even though China’s reports refer to the “One Belt One Road” initiative, Vietnamese media rarely cite or transmit the reports of Chinese official media. Therefore, the preliminary finding is that the Vietnam’s media VOV is influenced by foreign media, especially the western media, and tends to pay attention to the perspectives and opinions of the third-party countries and media. The negative trend of Vietnamese media is more prominent: The tendency of news reports can be judged through the title, the introduction, the context of text, word usage and the news source. This part is not only aimed at the report tendency of China's "One Belt And One Road" initiative, but also refers to the report tendency of all China’s aspects consisting of positive, neutral and negative. Looking at the overall, CRI's reporting tendency is positive, reflects a support, praise, affirmation of China's "One Belt And One Road" initiative and China's overall appearance, and builds a good national image. VOV's reporting tendency is mainly positive (42 articles, account for 53%), next come negative (21 articles, account for 27%) and neutral (16 articles, account for 20%). This shows that when VOV involved the China and China "One Belt and One Road" initiative, it mainly reported on its support, praise and affirmation. At the same time, however, there are also some notable news reports that take a questioning, blaming, and denying attitude reported (Figure 1). Figure 1: Time distribution and report trend of VOV involving “One Belt And One Road” initiative. A further analysis was conducted according to time distribution and tendency of the quantity of news reports involving the “One Belt One Road” initiative, found that the increasing trend in quantity reflects the Vietnamese media pay more and more attention to the initiative "One Belt And One Road", among which the quantity of positive reports tended to increase from 2013 to 2016. Meanwhile, the number of negative reports abruptly increased in two periods 2013-2014 (none article and 6 articles), and 2015-2016 (5 articles and 10 articles), the main reason came from the drilling work of China ocean oil platform 981 in May 2014, since then, the problem of the Chinese- Vietnamese territorial waters was mentioned in the majority of negative reports context. In addition, along with VOV’s continuously increasing attention and the official launching of the "One Belt One Road" initiative, all countries in the world came up with their own opinion on China’s initiative "One Belt And One Road", in which referred to some countries’ expression with doubtful and hesitant attitude as well. “One Belt One Road” is not Vietnamese media‘s crucial highlight to attract the reader: From the point of overall content, CRI reports focus on the content, idea and related events of the "One Belt One Road" initiative, while VOV reports focus on the initiative’s related events and the detailed process, background and reason of events. Its characteristics can be found in the title of news reports. There are totally 30 reports of CRI referring to "One Belt One Road", in which "One Belt And One Road" appears on 27 reports’ title, “Maritime Silk Road” appears on 2 reports’ title, and only one report’s title has no relevant word. On the contrary, "One Belt One Road" appears on 2 titles, “New Silk Road” appears on 5 titles, and remaining 72 titles have no relevant word in VOV reports. Obviously, China's CRI report has a clear target and directivity, so that Vietnamese readers can judge and learn the correlation between its content and "One Belt One Road" through the news titles. And majority of VOV titles have no appearance of these key words, it means that the media did not consider “One Belt One Road" as highlight or important topic to attract the reader, they need to read more in the introduction and main text to get the relevant information of initiatives. The Vietnamese media is more concerned about the territorial sea: The scale of “one belt one road initiative” is very grand, involves over 60 countries and regions along the route Obviously, the context concerning the "One Belt and Road Initiative" will be closely linked to the content of diplomatic relations and cooperation between China and foreign countries. In regard to reports topic, the news reports of both media China CRI and Vietnam VOV refer to the content and cooperation in many aspects, namely Sino-foreign diplomacy, economy, culture and art, information dissemination, education, military, territorial waters, and China’s domestic events. CRI's news reports are mainly related to the content of Sino-foreign diplomacy and economic cooperation, while VOV also pays special attention to the content of the territorial sea issue besides the above two aspects (Table 1). In recent years, China's territorial waters issue has been a common concern of international audiences. Whereas since the event of China’s Ocean Oil Drilling Rig 981 happened in May 2014, the Vietnamese media have been concerning China's every move in this sea area. Later, the Sino-Philippine arbitration once again raised the heat of this topic up. Hence, the territorial disputes between China and some countries have been extremely attracting attention of the United States, Japan, and ASEAN countries. According to statistics, none of CRI’s 30 articles refers to territorial sea issues, while VOV‘s 38 articles refer to this issue, account for half of the total number of reports. Currently, the biggest problem of the Sino-Vietnam relation appear in the two countries’ territorial waters sovereignty, although both sides’ leaders reached a consensus in the methods and principles on dispute settlement, the territorial waters sovereignty is still one of the relatively remarkable problem. The Vietnamese media's discourse style is conflictive and complicated: From the perspective of the use of word in relevant reports of CRI and VOV, it clearly shows the difference of the languages used by the two media. The terms used by China's CRI are mostly commendatory terms, which are intended to emphasizing the major benefits of participating in "One Belt And One Road" in the fields of economic and trade cooperation (Table 2). Table 2: CRI reported beliefs, key opinions and use of words Related to one Belt one Road initiative. Some titles use the phrases "Welcome …to participate in", "positively participate in”, emphasize that China is very enthusiastically welcome other countries to participate in the “one Belt one Road" initiative. In addition, this kind of expression present to Vietnamese readers that up to now China’s “one Belt one Road" initiative has received the attention and support from many countries. Such news contents directly affirm and praise the initiative, as well as further indirectly convince Vietnam audience have faith in the “one Belt one Road” initiative which have “important meaning”, can "promote cooperation", are “beneficial to the long-term stable development”, bring "prosperity" and "development" to China and other countries. The language used in Vietnam VOV news reports involving the “one Belt one Road” initiative is more plentiful than China CRI. As referring to the view of two countries’ senior leaders about the “one Belt one Road” the obviously colorful positive words were also used to describe the two sides agreed that the initiative would promote the development of the two countries. However, when the territorial dispute issue was linked to the relevant view or content of the initiative, VOV would use many offensive words to accuse China. At the same time, the negative views and attitudes of foreign governments, experts or media were also cited to raise questions and objections to the “one Belt one Road” initiative and relevant content (Table 3). Table 3: The report tendency, main points and use of terms of VOV involving “one Belt one Road” initiative. The territorial dispute becomes a major obstacle to the implementation the “one Belt one Road” initiative. "Infringement", "illegal", provocation, "invasion", "violation", "sticking point"
Thus it can be seen that the discourse used by Vietnam VOV is contradictory and complex, on the one hand, it expresses supportive affirmative attitude, and on the other hand, it refers to the opinion of question and accusation to report. But in term of the characteristics and position of VOV news network, it is directly subordinate to Vietnamese radio station supervised by the Vietnamese government; VOV's mission is to transmit the line and policy of the Vietnamese communist party and the law of the Socialist Republic of Vietnam, and to improve people’s intellection and spiritual life. Hence, VOV's view of the “one Belt one Road” still indirectly reflects the voice of Vietnamese government. In other words, VOV presents the Vietnamese government ‘s official attitude through the news involving the official opinions of the two countries, as well as transmits the negative news reports and comments under Vietnamese government supervision, give Vietnamese readers a comprehensive understanding, therefore the Vietnamese audience easily arise the skeptical attitude to the “one Belt one Road” initiative. The reflection of foreign countries indirectly reveals the cautious attitude of Vietnamese media: In respect of foreign countries’ attitudes and perceptions of the “one Belt one Road” initiative, nine of thirty CRI’s reports involve this content, respectively refer to the viewpoint of the Maldives, Mongolia, Laos, Switzerland, Vietnam, Indonesia, Malaysia,, Madagascar and Hungary. They basically support and affirm the implementation of the “Belt and Road” initiative. Table 4: The reaction of other countries on the Vietnamese media VOV. On the Vietnamese media VOV, most of the above countries and regions support the construction and implementation of the " one Belt one Road” initiative, but some countries are also suspicious (Russia) and hesitant (India and Southeast Asian countries). The response of the Vietnamese media VOV to readers is more comprehensive than that of the Chinese media. Hence it can be deduced that firstly, in addition to foreign countries’ support and affirmative attitude, CRI did not unintentionally or intentionally present the doubtful, hesitant, reconsider attitude of the foreign countries. For Vietnamese readers, it obviously cover-up of foreign countries’ negative reactions to their initiatives, but it is perfectly reasonable towards China's own interests. Second, by reporting third parties' hesitant and skeptical attitudes and their reasons, VOV makes Vietnamese readers feel more suspicious about the initiative, thus indirectly expresses Vietnam's cautious attitude towards the initiative. Further statistics of word frequency found that although every report mentions the "Belt and Road", the initiative is often mentioned as the "Silk Road", total 125 times, among which the number of occurrences of "Maritime Silk Road" as an important part of the "one Belt one Road" initiative and "Economic Belt" is 36 times and 25 times respectively. This suggests that the Vietnamese media VOV is more inclined to call the “Belt and Road” initiative as “Silk Road", increase focus on the content of “Maritime Silk Road". The sea area of the South China Sea (known as the East Sea in Vietnam) has crucial economic, geopolitical and geostrategic position; it is a maritime transportation route connecting the Indian Ocean and the Pacific Ocean and one of the most dynamic routes in maritime transportation all over the word. Therefore, any dispute in this area will directly affect the interests of many countries. Vietnamese media VOV stressed that the Silk Road crosses by the sea area with full of sovereignty dispute, and in recent years, the contradictions and conflicts of territorial waters sovereignty have been occurred among China, Vietnam and the Philippines. If the issue of territorial waters sovereignty has not be solved completely yet, it will still be the stuck-point between China and ASEAN countries, will directly affect the cognition and reflection of ASEAN countries about the "one Belt one Road" initiative. China highly needs the support of the ASEAN countries to the Maritime Silk Road, it is called a supplement to the landbased Silk Road Economic Belt. In spite of the rapid implementation progress of the progress of the Economic Belt, the continuous improvement of the strength of the Chinese naval forces and Coast Guard make neighboring countries feel threatened, so in these countries' view, the Maritime Silk Road is still a fully vague idea. In addition, the number of occurrences of words as the East Sea, dispute, sea area, contradiction, conflict, violation and corruption is more than which reflect the prominence of the territorial waters dispute in the report (Figure 2). 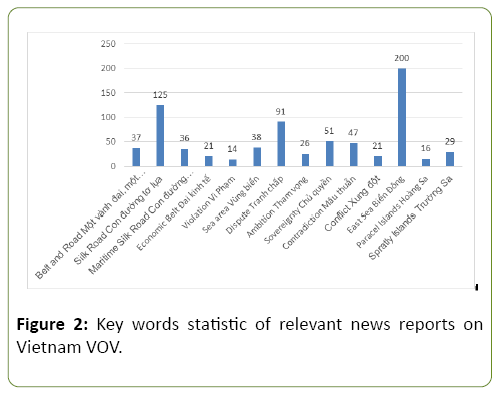 Figure 2: Key words statistic of relevant news reports on Vietnam VOV. It is noteworthy that China clearly emphasized that the "territorial waters dispute" could only be resolved through bilateral consultation, and required no interference from any third party, while the Vietnamese media VOV tended to enlarge the problem of territorial disputes. The Vietnamese media mentioned not only the dispute between China and Vietnam, but also the Sino-Philippine arbitration, the dispute of Senkaku Islands between China and Japan, and the collision with Indonesian vessel. Since then it emphasized that the territorial dispute is not a question between nations, but an international problem which not only affects the interests between the two countries, but also affects the interests of other countries as well as the peace and security in the region and the world. Besides, VOV also showed that China had introduced its own initiatives to countries all over the world, especially economic projects welcome the participation of all countries, this means that once all countries participate, they must abide by China’s requirements, and accept China's leading position as well, this is related to China's own interests, which also involve all disputes of the territorial sea sovereignty. If China successfully implements the Maritime Silk Road, it will mean that China would justifiably increase its influence in this sea area. Obviously, this will lead to the loss of equality in cooperation, but in the CRI, these views are only a kind of "misunderstanding". Because the “one Belt one Road” initiative involves the territorial dispute and affects Vietnam's interests and sovereignty, so in 11 reports on Vietnam and the "Belt and Road” initiative, it is not difficult to find out the Vietnamese media reported the Vietnam’s viewpoints with an especially cautious attitude. The content of the report focus on the mutual visits of the top leaders of China and Vietnam, and the common statement of both sides. They first mentioned the history of the friendship between China and Vietnam, the two countries’ achievements in various fields of cooperation. The second is the problem of Sino-Vietnamese relations, which is territorial water, both sides reached an agreement on solutions to this issue, but at the same time, they avoided to determine the ownership of sea area sovereignty. Once again, they talked about the willingness of China and Vietnam to promote cooperation within the framework of “one Belt one Road” and "two corridors and one circle". In particular, in these reports, “one Belt one Road” and "two corridors and one circle" appeared in the same sentence. The geographic scope of cooperation within the framework of “Belt and Road" and "two corridors and one circle” does not contain the sea area in dispute. In other words, the Vietnamese government’s view presented by Vietnamese media VOV is to agree and support the construction of the "Belt and Road" initiative but does not involve the disputed sea area. This media created a close and rational context which can both represent a supportive attitude and show its firm standpoint, safeguard of its own interests. In addition, combining with the transmission of "suspicious" and "hesitant" attitude of other countries reflected Vietnam’s "cautious" attitude. There are obvious differences of multi-aspects such as sources, tendency, topics and the way of discourse between the two media. China CRI tends to spread the economic benefits brought by the "Belt and Road" initiative to Vietnam audience, presents the positive views and supportive, praising and positive attitude of the top leaders of Chinese and foreign government, international scholars, Chinese and foreign enterprises, emphasizes 100-year plan of the " one Belt one Road" initiative which is supported and expected by many countries of the world, the implementation of the " one Belt one Road" will bring multiple interests to all countries along the route. The VOV, which can represent the voice of Vietnamese government, does not focus on the economic interests of the initiative, but tends to the controversy of the initiative, the cited views of foreign governments’ top leaders and international scholars and the use of word in the report are relatively plentiful; on the one hand, it is similar to the "one Belt one Road” Initiative as described by China's CRI, and on the other hand, it expresses doubt and negative, supposes that the Chinese government wants to take this opportunity to enhance its position and influence, and bring a threats to other countries. In recent years, despite the fact that China-Vietnam bilateral relations have been continuously strengthened and promoted, territorial waters dispute is still one of the most striking issues. Among the 79 related reports of VOV, the issue of maritime territorial disputes often appears and allegations of China's every move in this area, VOV use it as a foundation to lead to relevant content of the "One Belt One Road" initiative. This reflects two issues: first, VOV emphasizes Vietnam's sovereignty and standpoint on the issue of territorial waters disputes, at the same time, it accuses China’s every move of violating sovereignty and international laws; second, this sea area is the essential part of the "21st Century Maritime Silk Road", mentioning maritime dispute issues means indirectly emphasizing the issue of the "One Belt One Road Initiative”. In addition, the Vietnamese media VOV has repeatedly cited the negative reports of third parties, further making Vietnamese readers call into question with the real purpose of the initiative. Zheng H, Li J (2016) The strategic conception of "One Belt One Road" Under the construction of American media --Analysis based on the reports of the New York Times and the Washington Post. Shanghai University of International Business and Economics 1: 87-96. Ma JY (2015) The United States' recognition and response to China's “One Belt One Road” initiative. The Chinese World Economy and Politics 10: 104-132. Wang YW (2015) "One Belt One Road": Opportunities and Challenges. Beijing, China: Chinese People's Publishing House. Liu CM, Sun YF (2015) China's "One Belt One Road" strategy international response and coping strategies. Shandong Social Sciences 8: 30-39. Do QD (2015) Management and development of Vietnam News Information. Hanoi. Vietnam: Vietnam Information and Media Press. Nguyen TML (2013) Orientation of News media content, Guiding activity and timeliness. Doctorial disertation, Vietnam Institute of Journalism and Information, Hanoi, Vietnam. Pan ZD, Kosicki GM (1993) Framing analysis: an approach to news discourse. Political Communication 10: 55-75. Goffman E (1986) Frame analysis: An essay on the organization of experience. Contemporary Sociology 4: 1093-1094. Minsky M (1975) A framework for representing knowledge, the psychology of computer vision. Patrick Winston. Pattern Recognition 8: 193. Gitlin T (1980) The whole world is watching: mass media in the making & unmaking of the new left: with a new preface. Foreign Affairs V: 98. Gamson WA, Modigliani A (1989) Media discourse and public opinion on nuclear power: a constructionist approach. American Journal of Sociology 95: 1-37. Zhou X (2008) Cultural dimensions and framing the internet in China cross-cultural study of newspapers' coverage in Hong Kong, Singapore, the US and the UK. International Communication Gazette 70: 117-136. Pan ZD (2006) Architecture Analysis: An area needed for theoretical clarification. The Chinese Journal of Communications and Society 1: 17-46. Nelson TE, Oxley ZM, Clawson RA (1997) Toward a psychology of framing effects. Political Behavior 19: 221-246. Schlesinger M, Lau RR (2000) The meaning and measure of policy metaphors. American Political Science Review 94: 611-626.